Thalipeeth using bhajni - My previous post was bhajni for thalipeeth. 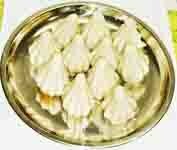 I have prepared this thalipeeth using that flour. This is one of our favorite breakfast dish. Sometimes I make thalipeeth and serve with some chutney and yogurt and my breakfast task gets over. Thalipeeth is prepared with different versions in Maharashtrian house hold. Sometimes, I add sweet corns to the batter as it gives different texture and taste. 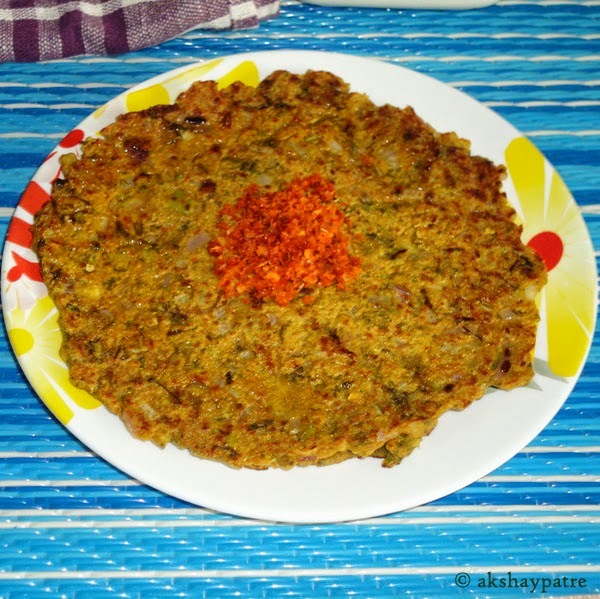 This thalipeeth is delicious, filling and healthy as it contains rice and three varieties of whole grams. I have added onions, fresh coriander, grated coconut, green chillies, ginger and jaggery to give a slightly spicy and sweet taste. 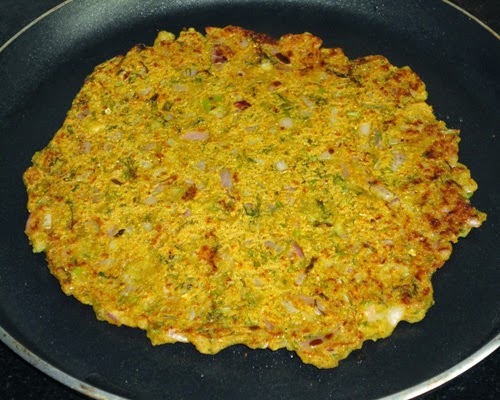 For a variation you can also prepare thalipeeth by adding vegetables like green peas and carrots.Also check multi grain flour or bhajani for thalipeeth. Put the bhajni in a large bowl. Add all the ingredients except ghee and oil. Mix well and make a thick batter using water. Heat a non-stick griddle and pour 1/4 tsp of oil on it and spread. 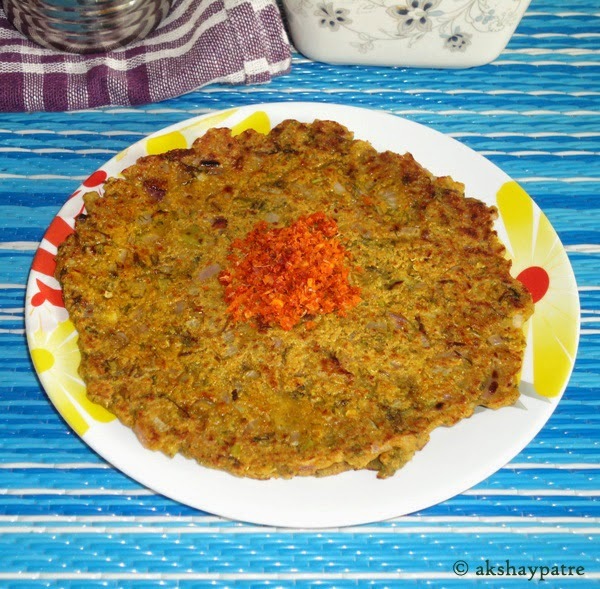 Put one orange sized lump of batter on tawa and flatten it with your palm, sprinkle some water on the batter while flattening. Pour 1/4 tsp of oil around the edges. Shallow fry till the thalipeeth becomes golden colour from both sides. Remove from the griddle, apply 1/2 tsp of ghee on the thalipeeth and serve hot with your favorite chutney. 1. Put the bhajni in a large bowl. 2. Add all the ingredients except ghee and oil. Mix well and make a thick batter using water. 3. Heat a non-stick griddle and pour 1/4 tsp of oil on it and spread. Put one orange sized lump of batter on tawa and flatten it with your palm, sprinkle some water on the batter while flattening. 4. Pour 1/4 tsp of oil around the edges. Shallow fry till the thalipeeth becomes golden colour from both sides. 5. Remove from the griddle, apply 1/2 tsp of ghee on the thalipeeth and serve hot with your favorite chutney. Thanks Shobana, Do try and let me know. Thanks for visiting my blog and your lovely comment. Thanks Vandana, do try and let me know the taste.